The Grand Victoria is your luxury floating home. Mid-size master bedrooms with a large US kind size beds, cream tufted headboards, en suite bath and seating. 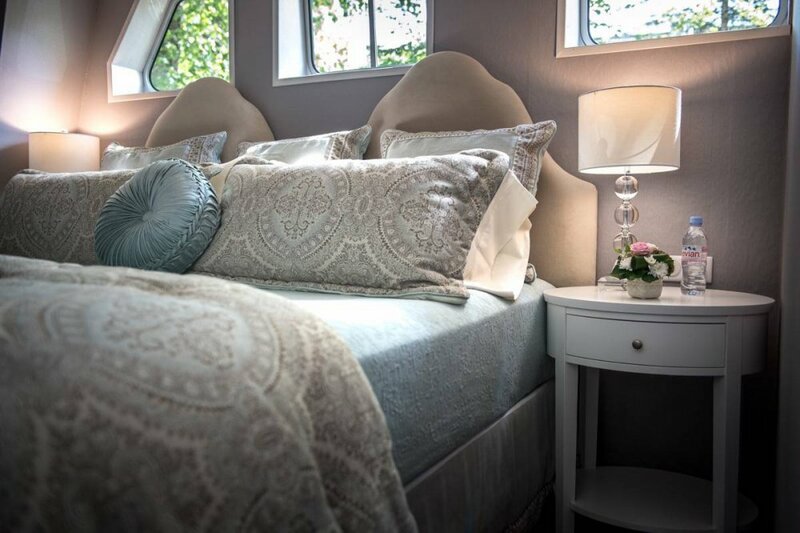 Light and breezy modern staterooms with white ceilings, damask comforter embellished with solid velvet pipping, coverlet with scrollwork designs, several king size pillows offering several different layers of comfort. Neutral wallpaper and taupe flooring offer calm and inviting designs. Our guests’ comfort is elevated when they slip between exceptionally soft Egyptian cotton to transform you into an indulgent oasis. The Grand Victoria offers an elegant and luxurious sleep experience with attention to detail. Grand Victoria staterooms were designed to ensure guests’ experience includes all the must haves. 42” flat screen TVs, Apple TV with access to HD entertainment, complimentary Wi-Fi access, heat/cool climate control, choice of bed configuration two twins or one king, nightly turn-down service, bedside tables with reading lamps, in-room safe, plenty of storage space with a built-in closet space, complimentary laundry service, and plush robes. 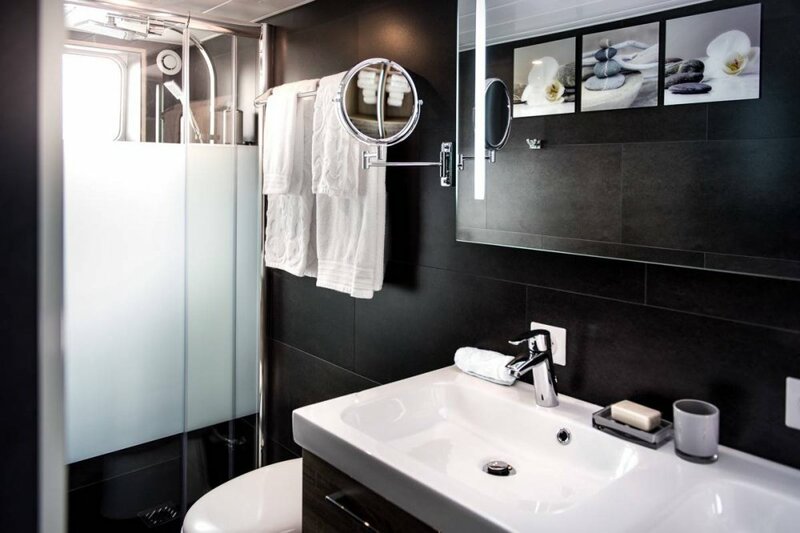 Our en-suite bathrooms are spa inspired with walk-in showers. The galss doors and rain showerhead offers guests an exhilarating shower experience. The overhead rain spray is essential for a steamy full body shower bathing experience. The bathroom has a chic spa pleasure that will give you double vision. Our vanities offer double everything sinks, back lit mirrors, and drawer space. Our minimalist bathroom design with dark grey metro tile create a classic yet modern feel have recessed panel cabinets with extra towels, bath mats, hair dryers, shampoo, conditioner, French soaps and skin conditioners.